HABIT: Flowers similar to the calla lilies but unimpressive. Huge caladium like leaves on 3-5 stalks. CULTURE: Needs loose, moist highly organic soil for best results. USES: Large foliage texture, tropical effect. PROBLEMS: Few; Freeze damage in Zones 1-7. NOTES: Colocasia is very similar but has doesn’t have raised veins as does Alocasia. Colocasia is the mass planting that grow on the edge of Turtle Creek in Dallas. 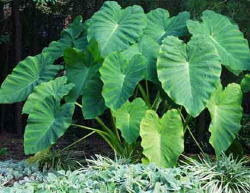 Bananas, elephant ears, Hoja santa and other large leaf perennials should be cut off leaving 2-3" stump. Then cover the stump with shredded mulch. Unless the roots stay too wet during the winter from frequent rains or poor drainage, the plants be back next spring to once again put on a show. Some gardeners put a piece of old carpet over the stump and the mulch on top of that if they concerned about the moisture rotting the crown of the plants.